Diana Atwood Johnson surrendered peacefully on January 1, 2018 to a rare progressive autoimmune disease that attacked her lungs in 2013. She was the daughter of Edwin Havens Atwood and Barbara Field Atwood (both deceased) and is survived by her stepmother of 50 years, Eileen Atwood, all of Rochester, NY. Her two brothers, Peter and Ted Atwood, predeceased her. Born in Rochester, New York in 1946, she spent 4 years at Northfield School for Girls and received a BA from Skidmore College in 1976. Diana founded the Old Lyme Inn in 1976 and built it over 25 years into a nationally renowned restaurant and country inn. At the same time she became involved in her community, helping found Lyme Academy College of Fine Arts, the Connecticut River Museum, Mystic Coast & Country Travel & Leisure Council, the Maritime Bank and Trust and the Bank of Southeastern Connecticut. She also served on the Board of Inncom International, a manufacturer of advanced guest room controls, which was sold to Honeywell in 2012. Diana was passionate about land protection and chaired the Town of Old Lyme’s Open Space Commission for almost 20 years. In addition, she was appointed to the Connecticut State Natural Heritage, Open Space and Watershed Land Acquisition Review Board in 1997 and spent 19 years as its Chair. Diana served on the board of The Nature Conservancy and the Trust for Public Land. Diana was the first person to donate a scenic easement to the State of Connecticut when the Gateway Commission was established in 1973. 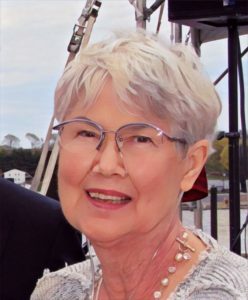 She was the Chairman of the Board of the Connecticut River Museum, a board member of the Florence Griswold Museum, the Old Lyme Educational Foundation, the Connecticut Restaurant Association and an advisor to the Madry Temple’s Building Committee (New London, CT). She has provided philanthropic advice to all the organizations with which she was involved. As a legacy, she has established funds at the Community Foundation of Eastern Connecticut to provide scholarships for minorities from New London County with interests in the environment and the arts. She has also established an endowment fund for the 1817 Sill House and a scholarship fund for minorities at Lyme Academy College of Fine Arts. Diana received notable recognition for her professionalism and community service. In 1996 she received the Industry Image award from the Connecticut Restaurant Association. In 1999 Diana received the Distinguished Advocate for the Arts award from the State of Connecticut. In 2012 she was named citizen of the Year in Old Lyme. In 2014 she was honored with the Community Service award from Northfield School for Girls. In 2015 she received the Dave Engelman Volunteer Benchmark Award from Connecticut Audubon and an honorary Doctorate of Humane Letters from the University of New Haven. Birds provided much respite during Diana’s health challenges. She became an exceptional nature photographer and had several exhibitions around New London County of her bird photographs. “Swallow Tales,” her privately published book, presents her photographs of the swallow phenomena on the Connecticut River. On her birthday in November 2017, the CT Land Conservation Council renamed its amateur photographer photo contest in her honor. Diana is survived by her nieces, Nan Atwood Stone and Barbara Atwood Cobb and her nephew, Peter Moore Atwood II and their children; her stepson and his wife, Scott and Shelley Johnson and their children Max and Alex Johnson whom she considered her grandsons; Spencer McFadden Hoge, whom she also considered a grandson and his mother Cynthia McFadden along with many dear friends including Luanne Rice, Jane Ghazarossian, Jack Madry, Sarah Blair, Mary Ann Besier, Becky McAdams, Andy Griswold, Mary Jo Nosal, Teri Lewis and David Pease. Diana was a direct descendant of many of the early settlers of colonial New England, including the Seldens of Lyme, the Atwoods of Plymouth and Chatham, MA, the Moores of New Hampshire and the Ellwangers of Germany and then Rochester, NY where she was born. Some of her Selden ancestors, who came to Lyme in the late 1600’s, went west along the Erie Canal in the 1800’s thinking it was too crowded in Connecticut! There will be a memorial service at the Madry Temple Church in New London at a later date in the spring. Donations in Diana’s memory may be made to the Pastor’s Discretionary Fund at the Madry Temple Church, 25 Manwaring Street, New London, CT 06320.